I LOVE MY FAMILY..but today, I’m tired. I’m tired of constantly picking up toys. I’m tired of laundry. I’m tired of cleaning spilled milk from cereal off the floor. I’m tired of not being able to go to the bathroom by myself. I’m tired of not being able to eat anything without little fingers demanding it from me. I’m tired of the ear-piercing screaming from my son. I’m tired of kids not getting along. I’m tired of not feeling appreciated. To everyone reading this who may be thinking “yea, yea I’ve heard all these mommy woes a thousand times” – stay with me. I do have a point other than just needing to vent some frustration. I’ve been reading a book by Steven Furtick called Crash The Chatterbox. There is a section in this where he sheds a light of interpretation on a popular biblical story that I had never seen before. In 1 Kings 19:1-3 we read..
“Now Ahab told Jezebel everything Elijah had done and how he had killed all the prophets with the sword. So Jezebel sent a messenger to Elijah to say “May the gods deal with me, be it ever so severely, if by this time tomorrow I do not make your life like that of one of them. I don’t blame him. If someone spoke words to me like what Jezebel (the King’s wife) said to him, I would probably run too. What makes Elijah’s running seem a little strange is what had just happened prior to Jezebel’s threats. Elijah had just called down fire from heaven! And if that alone isn’t impressive enough it says that the fire did not just burn up the sacrifice, but it ‘licked up the water in the trench’. God showed up for Elijah – big time! Wouldn’t this seem to be an ultimate confidence boost? Wouldn’t this make the threats of a crazy, evil, God-hating Jezebel seem kinda piddly in comparison? You would sure think so! So why in the world is Elijah “afraid and running for his life” from her?!? 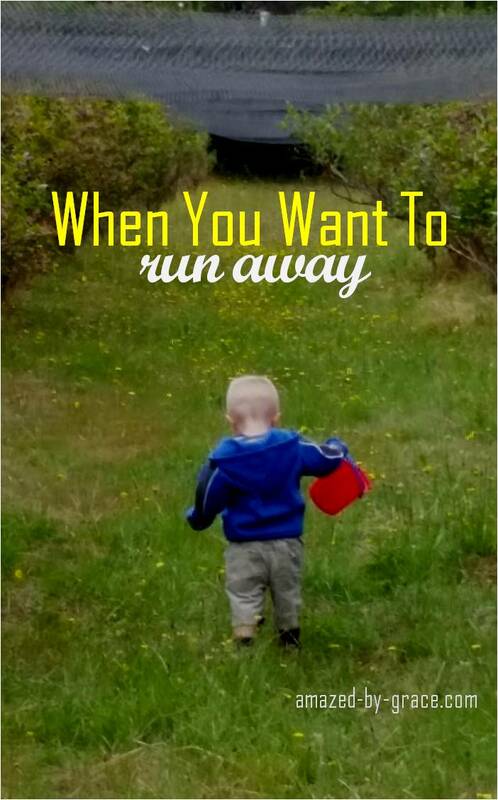 Now I’m not trying to compare these little battles I face as a mom to that of Elijah’s – but they do sometimes leave me with feelings of doubt and discouragement that make me want to run from them. Motherhood is one of the many ministries the Lord calls His people to that have seasons of difficulty. Seasons that take a lot of faith and courage. Persistence and endurance. Selflessness and sacrifice. Sometimes, it seems like it would be much easier to give up and run away then to run the race he sets before us. So how do we stay in the fight when giants of doubt and discouragement lurk in the corner arena of our minds? Man does not live by bread alone, but by every Word that proceeds from the mouth of God. His Word is sustaining strength to us. His Word is our sword (Ehp 6:17). We can not expect to do battle without storing it up and allowing it to transform our minds us. Period. Application: Wait in His presence. We need to wait for His gentle whispers that remind us and confirm to us our calling. Those moments when I feel I want to ‘run from my life’ it probably means I’m lacking nourishment. I need to STOP and eat up the strength of His word and wait for His affirming whispers that renew my sense of purpose in that which He is calling me to. When I do this, He is always faithful to provide that fire I need to love and serve my family..or any other work He would have me do. Thank you. I’m on a journey just like Abraham. I and my daughter got rid of all the stuff and moved clear across the country. Things have been unfolding slowly for us but our relationship has blossomed. It was save our lives, especially hers or stay and watch disaster happen. We’ve spent a lot of time sleeping in our car, but we know it’s part of the journey. I love your story and it had been confirmation to keep plugging ahead. God always shows up right on time. I just started blogging myself. unconditionallyu.wordpress.com. Thank you again, angels show up when called or needed. So glad you were encouraged! And glad that you have started blogging. Sounds like God is writing a great story within your life – blogging is a great way to share how He is working! Blessings to you! I think most moms (even yours!) can relate to these feelings. Especially at this time of the year when the world seems to spin out of control at times. Thank you for taking time out of your busy schedule to continue to share what you are feeling, and to share a lesson about where you draw your strength and how you cope. The Lord has used your story to encourage and let another mother know she’s not alone. She’s right…Angels show up right on time. Megan, this is a fitting post for me this weekend as I sit in bed under the weather 😦 … and like Elijah, just feeling a tad overwhelmed by life itself. “Those moments when I feel I want to ‘run from my life’ it probably means I’m lacking nourishment. I need to STOP and eat up the strength of His word and wait for His affirming whispers that renew my sense of purpose in that which He is calling me to.” You are so right. There is no way around it. Strength is found by abiding in HIm… and His Word is our nourishment. Well done. I loved the insight in this post!